One of the more visible changes of the Windows Vista operating system was the Windows Vista Sidebar which made it possible to put so called gadgets on the Windows Desktop. Gadgets are small applications that can display all kinds of information such as RSS news feeds, contacts or system information. 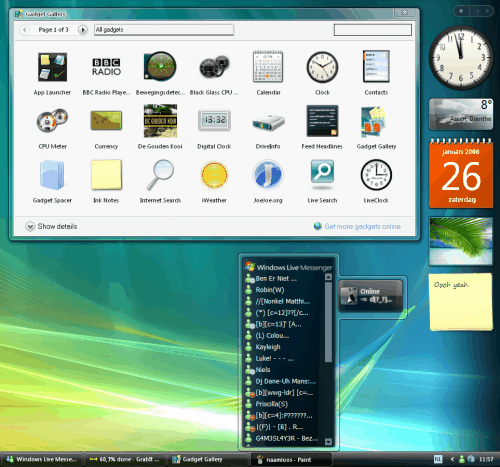 Many Windows Vista users like the Windows Sidebar, others feel that it is to restricted to one part of the screen. Microsoft has already announced that they will change that behavior in Windows 7 so that users can place gadgets wherever they want on the desktop. The pack includes three different applications that are needed to install, display and maintain the Windows Vista Sidebar in Windows XP. First there is Alky For Applications which can simply be installed. Once that is done the Windows Vista Sidebar can be installed and will be operational afterwards. The pack comes with many gadgets and a tool called Gadget Gallery which can be used to add new gadgets to the sidebar. Already available gadgets can be added by right-clicking the sidebar and selecting a gadget from the list of installed gadgets. 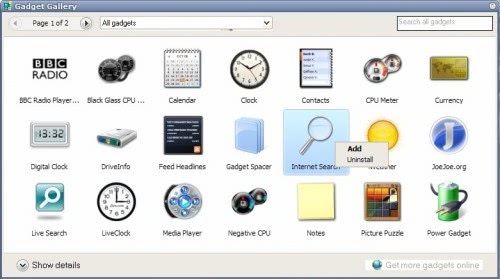 Each gadget can be added by right-clicking it and selecting Add from the context menu. Even more interesting than this is the ability to download gadgets from the Windows Vista Gallery site over at Microsoft. It requires some manual work but it's easily done and works perfectly fine. The gadget needs to be downloaded and unpacked. It comes with the .gadget extension but it can easily be unpacked by most unpackers. Worked fine with 7-zip. The directory that will be created by unpacking the .gadget file, adding the .gadget extension to the root directory of it and moving it to the Shared Gadgets directory of the sidebar application. One interesting feature is the ability to detach a gadget from the sidebar so that it can be moved freely around on the desktop. The Sidebar requires roughly 20 Megabytes of computer memory when displaying the default three gadgets. How interesting! Thanks for the post Martin. works fine, but i uninstalled it after realizing most of the available gadgets are crap, and the decent ones can’t be customized very easily. In Vista the sidebar can be placed on either the left or right of the screen or turned off so that the gadgets sit anywhere on the desktop. Windows 7 just removes the sidebar totally. nice but where is the download link? I used to have alot more gadget options for sidebar when I bought this computer back in January and now I have maybe 6-7 maybe and told to download them off a website. Can someone please explain why? Thanks. Martin its great what you have done but you dont show the proper links to download the software? Can anybody tell me where to go for those cool sidebars with the items stored in them, that fade in and out when they are clicked onto? Heaps better than the boring stationary ones!! For all of the idiots that are so clueless that they can’t mouseover highlighted text and figure out that it’s a link. In this case the authors name (Joshoon) in the third paragraph of the page. The authors name is a link that will take you to his deviantart page where you can download the files, the download icon will be on the left side of the page and will look like a computer screen with an orange display, when you mouseover it the panel expand and you see the word ‘Download’. There at least no longer is a download icon at http://joshoon.deviantart.com/art/Windows-Sidebar-Real-one-Pack-75626472?loggedin=1, and the download link isn’t on the left-hand-side of the page. It just a link and is in the upper right-hand corner of the page, or it at least is for me. I’m using Firefox 16.0.1 and the download link is called “Download file” with a downward pointing green arrow to the left of the link, and text saying “RAR download 14.3 MB” just beneath the link. It couldn’t be made easier to find. wow its a cool software. But from where to download? I just tried uploading the .RAR download file for Joshoon’s Windows Sidebar for Vista ported to XP to virustotal.com and the locally installed Antivir (free version and updated daily) prevented the upload, reporting a Security Alert. Antivir reports having detected TR/Patched.GY.3 in the installer file, Windows_Sidebar_Installer.exe, and I’d like to get some feedback about this. Seeking help asap, I also tried to directly contact Joshoon using his website, Joshoon.com, but the website requires entering or typing over (the page says to “type over”, rather than “enter”) a security code and none is shown. If we don’t do that and click submit anyway, then the page simply refreshes and the user’s name, email address, and message are cleraed. And it happens with Firefox 16.0.1, updated Opera, as well as with MSIE. I tried all three and the security code doesn’t appear in any of these three browsers. So I hope to be able to get some feedback from the GHacks.net editor(s). Meanwhile, I’ll keep the sidebar download and just won’t try to install it. Your help or feedback will obviously be appreciated and I thank you in advance for this.